The farm was the original compound of the Tuthill family that includes a farmhouse, garage, potato barn and barn, which in its current form was completed in 1884. The property was recently added to the National Register of Historic Places. This is a seminal example of the farming heritage of the North Fork of Long Island, a region that has seen a renaissance in the growing and production of wine that has transformed the landscape and economy. The owner of the property is a wine enthusiast who wants to create a forum for the promotion of the viticulture of the region in a barn that reflects this very sentiment. 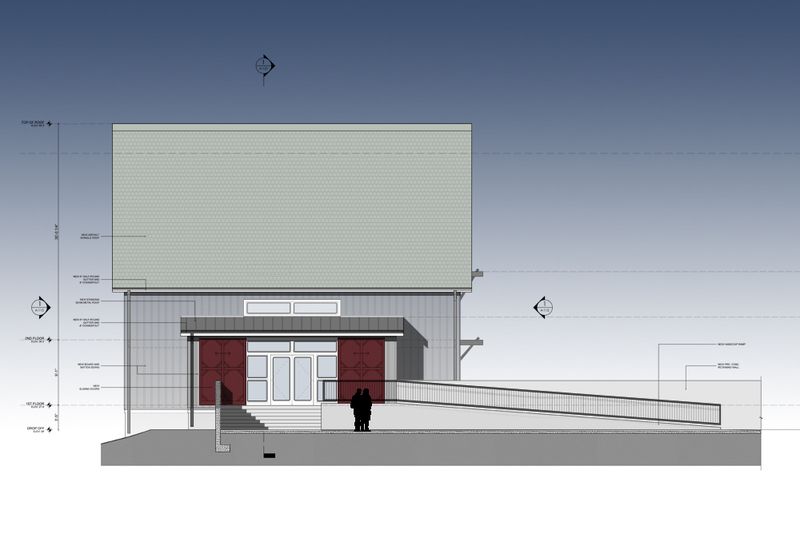 The program for the project is to create a wine bar and retail wine shop that focuses on the wine of the region, paired with food products that are sourced from local farms to promote local farmers.The 3-bay English style barn is 40’ x 40’ in plan and 50’ from floor to ridge. The post & beam oak wood structure is composed of timbers that span the technological advances of wood production thru the late 19th and early 20th centuries. The original members are hand-hewed beams and columns, and as the barn grew in size, the members reveal both the vertical oscillating saw blade and circular saw blade techniques. The site will be developed to accommodate parking, handicap ramp access and entry stairs that create a foreground to the barn structure. Long stonewalls will accent the rolling grade and create a formal entry to the barn. Large wine-red barn doors open into a new entry to the barn and red brick cellar. 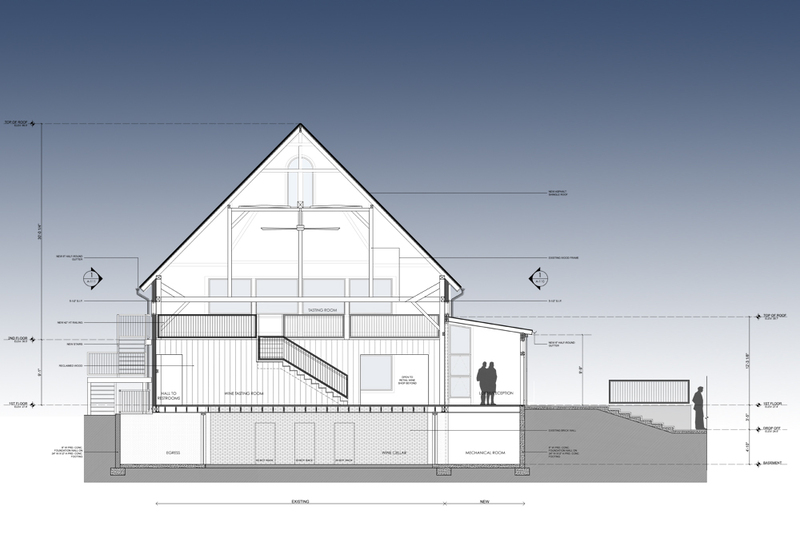 The open barn space provides for a compelling atmosphere with a loft space above That overlooks the open interiors. The honest and rustic quality of the wood structure complements the sensual and complex characters of wine culture. 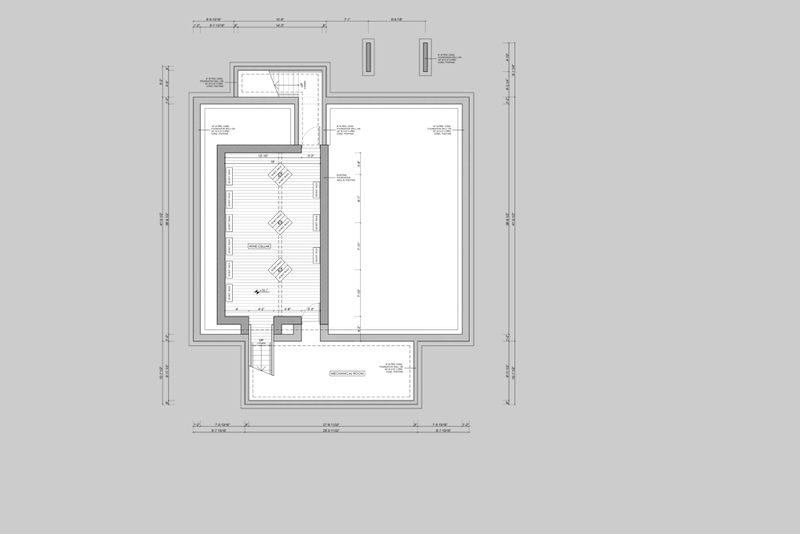 An open bar and seating area will occupy the lower space with a more formal seating area in the loft. A wine shop will occupy the space under the loft with it’s own entry. Structurally the barn requires some modifications. The existing perimeter field stone foundation has to be replaced which will require lifting the wood structure and pouring a new concrete foundation. This will allow us to keep the red brick cellar that will be used as a wine vault for the business. Secondly, we are applying 6” thick structural insulated panels to the exterior of the building frame. This will provide structural integrity, insulation and allow us to maintain the existing cedar siding to be exposed to the interior of the space. A new forced air HVAC system will be installed with a large centrally mounted ceiling fan.